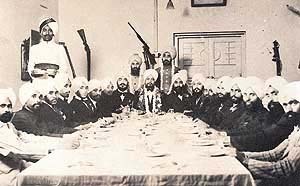 Deccani Sikhs of Hyderabad state at a get-together. The National Commission for Minorities has sanctioned a major project to Punjabi University, Patiala for conducting a study on "socio-economic conditions of Dakhni Sikhs in particular and minority Sikh communities settled in south and north-east India." The department of Sociology and Social Anthropology of university had submitted a proposal to the government prepared under the supervision of Dr Birinder Pal Singh, Professor in the Department and Dean of the Faculty of Social Sciences. After accepting the proposal the government sanctioned Rs 8,36,400 for the purpose of carrying out the study on the lifestyles and socio-economic conditions of the Dakhni Sikhs of the southern states and Assamiya Sikhs of the north eastern states. Talking about the significance of the study, Dr Jaspal Singh said that the Sikhs settled in south and north-eastern states have lived through unique kinds of ordeals and troubles which needed in-depth study. "They have their own sets of demographic and psychographic orientations which tend to make them an exclusive entity in themselves," said VC. Commenting upon the nature of the study, Dr Birinder Pal Singh said that collecting data about these communities will open up new vistas to understand the socio-historical and cultural aspects of these communities whose ancestors settled there long ago and also inspired other local people to adopt the Sikh religion.